Guzelyurt City which is also known as Morphou is located in the North West and is home to approximately 12,000 people. In Turkish this place name means beautiful country and this is not wrong. The stunning city is surrounded by citrus groves and their aroma is reason enough to visit especially when the blossoms are in bloom. If you are planning a visit then you will have to stop at Guzelyurt Bay where you will find the best views of the Mediterranean Sea and the Troodos Mountains together. There are a number of underwater springs located in Guzelyurt which help to feed and nourish the vegetables, melons, apples, and grapefruit which grow in this area. A large portion of the fruits that are grown here are exported but the remainder are used to make fruit juice or canned fruit which is then used by the locals. Guzelyurt is also home to the famous Orange Festival. This is a festival that is held annually and it lasts for two weeks. It is a major event in North Cyprus. 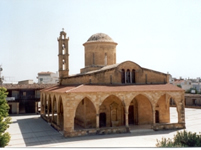 St. Mamas Church and Icon Museum is home to some valuable historical artefacts. These artefacts include the Sarcophagus of St. Mamas which according to legend was washed up on the shore. It is said that a peasant discovered it in the local bay and that he had a vision in which he was instructed to take the sarcophagus place it in its current location and build a monastery. There is also the Museum of Archaeology and Natural Sciences which houses artefacts from the Bronze Age. There is also a section in this museum that is dedicated to geology, reptiles, birds, insects, and the wildlife of the island. Pigadhes is a Bronze Age settlement that was built around 1600 BC. The horns of consecration which is held here was brought here in 1300 BC by some refugees from Crete. For sports enthusiasts there is the Cengiz Topel Golf Course which is located in the west of Guzelyurt. This is an 18 hole golf course. There is also some excellent shopping to be had in the old streets of the city and prices here are also quite cheap. Don’t forget you will need a rental car with a great deal of storage if you plan on shopping or playing golf and the opel zafira which its spacious boot is just perfect.